Tamil Nadu Forest Department has announced for the 878 Forest guard vacancies. A lot of students waiting for the announcement of Forester post. Eligible candidates can apply for the post till 5th Nov. 2018(till 5 pm). Check the official notification before applying the TN Forest officer Exam. Go through the TN Forest Guard Exam Syllabus 2018, click to view – Forest Guard Exam syllabus 2018. It is important to know syllabus before start preparing the exam. Read Syllabus and make the show you cover all the topics. Reading TN Forest Guard Previous Year Question Papers with solutions is important in exam point of view. A Lot of students searching for TN Forest Guard study materials pdf. We upload that materials both English and Tamil version in PDF format in our site. 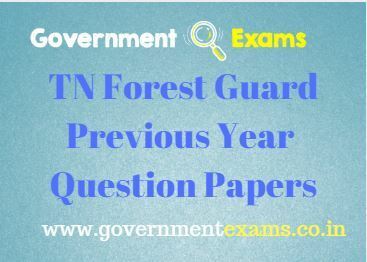 Here we upload various TN Forest Guard Previous Year Question Papers below. Kindly download that pdf and read once before appearing the Forest Guard exam. Note: For TN Forest Guard complete study materials/notes PDF Download, Click the link – Forest Guard Study Materials PDF. Check the Revised exam date and schedule by clicking the Link – Forester & Forest Guard Revised Exam Date. Check Forest Guard Model Question papers before CBT, Click to view – Forest Guard Model Question Papers.